A year before Scriabin died Kiril Kondrashin was born in Moscow, the city of Scriabin's birth. Kondrashin has a reputation similar in some ways to Evgeny Mravinsky. His recordings are not plenteous but what there is is often worth having. His recording (available on BMG-Melodiya) of Rachmaninov's Symphonic Dances is the only one to have though its age is beginning to tell. Scriabin wrote three symphonies of which the mult-movement first is worthy of reassessment. Scriabin has a reputation for being a bit of a bore with his prolix approach to the loftiest ideals. Anyone wanting an antidote to this should listen to the 1894 piano concerto - a superbly tuneful and romantic work which would appeal to anyone who enjoys the Tchaikovsky first piano concerto, the Saint-Saens concertos or the Palmgren works. The symphony dates from the same year as Bartók's Kossuth, Holbrooke's The Bells, Paderewski's symphony (recently recorded by Hyperion), Sibelius' Violin Concerto, Elgar's Second and Delius' Sea Drift. The orchestra is as expansive as Scriabin's programme is ambitious: eight horns, five trumpets, two harps, four flutes and so on. Luttes. 14:10 surge tune - elgarian - 17.01 resolute heroism. tchaikovskian balet music - liquid-toned heiratic trumpet baying to the heavens. Also Khachaturyan adagio. Voluptes is a sensuous movmenet full of attrcative touches. At 9:00 on track 2 the horns gently calling register touchingly and the solo violin evokes images of a dream of abandoned dionysian pleasure. The orchestral palette is Tchaikovskian. The third movement 'Jeu Divin' is Scriabin's vision of man giving himself completely to sensual joys and finding an apotheosis. From the pointedly sprightly trumpet calls to the overblown exalted climaxes you are never in doubt about Scr8abin's belief in his mission. This is a live concert recording as the occasional cough testifies. The sound has some depth and the typical advantages of a concert recording are evident here in the sense of occasion. At just over three quarters of an hour the disc does not offer best value as playing time. There used to be a BBC CD of the same work conducted byJohn Pritchard but one of the best sets around is the complete cycle conducted by Evgeny Svetlanov. Perhaps BMG-Melodiya will release this one. I hope so. I never warmed to the Philips Inbal/Frankfurt RSO set but other Scriabin collections by Muti and Ashkenazy are worth hearing. The performance of the third symphony by Kondrashin is founded on a committed interpretation but which does not entirely overcome doubts about the work itself. 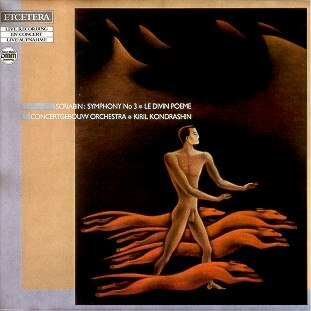 Still there is much to enjoy here if you appreciate headily indulgent grand symphonism.